Domino's has introduced a new dessert item: Chocolate Lava Crunch Cake. It is oven-baked chocolate cake, crunch on the outside, with warm chocolate fudge on the inside. 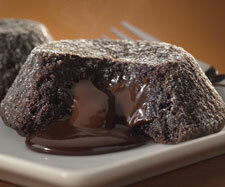 An order of 2 Chocolate Lava Crunch Cakes is priced at $3.99. But right now you can get a free Cake when you purchase an order of Domino's BreadBowl Pasta at regular price through September 13. Also, if you birthday happens to be in August, you can get a free Chocolate Lava Crunch Cake. Just stop by a Domino's location with proof of your birthday. I'm skeptical of the nutrition info. The serving weight is 85g/3oz. I'm not a cake expert by any means, but that looks like more then 3oz of cake. 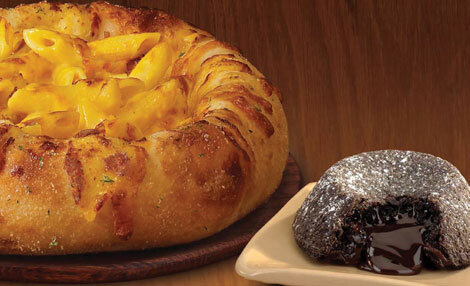 Am I the only one who thinks that the accompanying Pasta-in-a-Bread-Bowl is just stupidly redundant? Bread on bread? It's like wrapping a cheesesteak in slices of roast beef to hold it together. my birthday is aug. 4.i was at dominoes today and was told i could only get the free cake on the day of my birthday.that's not how i read it.it says "if your birthday is in August"dunno,maybe it's all in the reading. The pasta-breadbowl, regardless of any perceived redundancy...is rather GOOD.